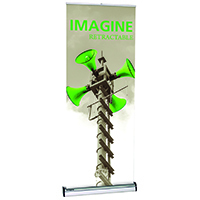 The Imagine Retractable Banner Stand is a premium unit that features a removable graphic cassette making frequent graphics changes and switch-outs a snap from event to event! Silver hardware base with removable graphic cassette, telescoping pole adjusts graphic height from 29.5" - 83.35" High. 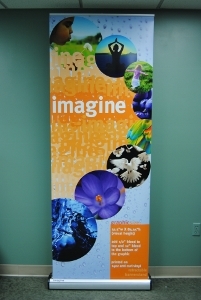 A full 31.5" width graphic makes this unit the best all purpose Banner Stand. 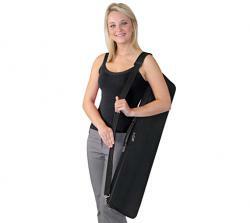 The Imagine comes with a padded carrying bag. Order additional cassettes and graphics separately. 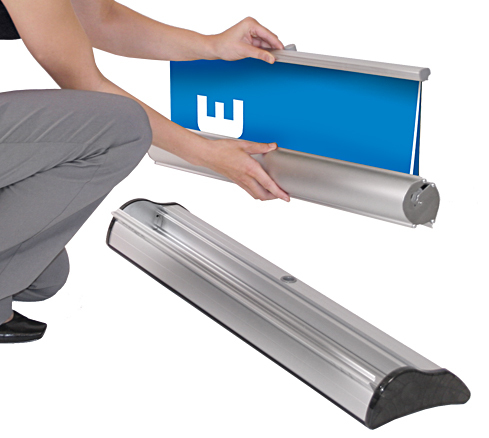 The Imagine Retractable Banner Stands is an eco-friendly product choice! 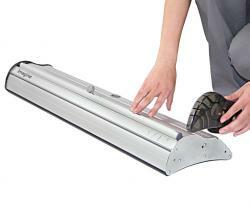 Weight: 18 pounds; Shipping size: 36" x 6" x 8"
Replacement Cassettes are available for this banner stand to change from one graphic to another.